Congratulations to all MPA skiers who participated in the ABC Relay races this past Saturday, January 12, at Theodore Wirth Park! The team of Henry Snider, Isak Nightingale, Peter Manolis, and Matthew Bourne put together an excellent race and came home with the first place trophy, beating second and third ranked teams. 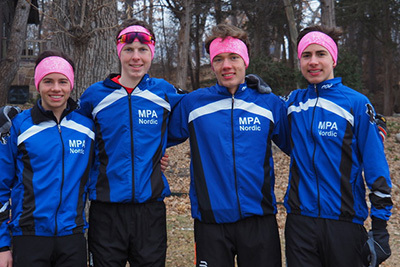 Eighteen schools participated in the relay in groups of four, and MPA came in first place, the best results in the school’s Nordic ski team history. Congratulations, Panthers!